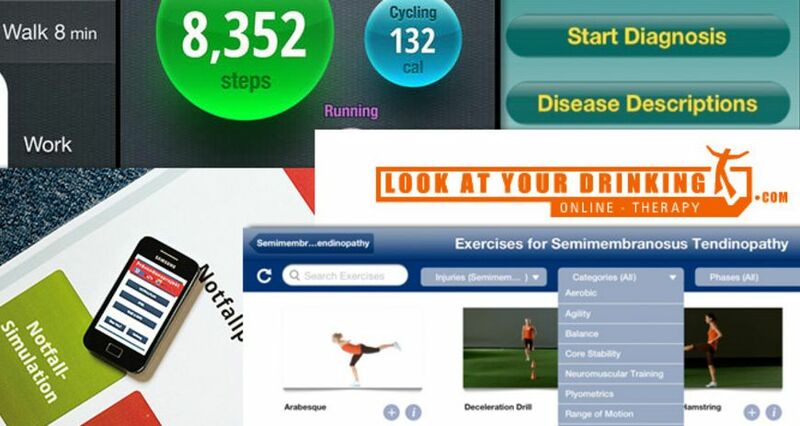 By now there is a multitude of smartphone applications available that are intended to help us remain healthy and fit. Our daily companions with their intuitive touch screen interface seem ideal for this purpose. Yet most apps are not a reliable tool, says Kai Sostmann, paediatrician and e-learning expert at the Charité hospital in Berlin. "If at all, these applications are only very crude tools with little impact on our behaviour as regards health. Often, they are not even medically approved", says Sostmann. "Apps cannot substitute seeing a doctor, they can only complement it. Seeing a real doctor remains important." People using apps should also seriously ask themselves what they want to disclose about themselves and what rather not. Does the app need to have access to one's contact register? Is the passing on of data to third parties really necessary? Where is the data stored? Which information is gathered? Not all apps feature a data privacy statement, which is why it is important that users themselves are capable of assessing potential risks. In combination with real life medical services, however, health apps for physicians and patients can be quite useful after all: in the areas of prevention, diagnosis, treatment and aftercare. This is called "blended health". For example, when an orthopaedist uses an app to compile a list of physiotherapy exercise films for a patient, thus enabling the latter to carry out these exercises alone at home guided by the app, then this app supports the role of the therapist, yet does not fully substitute it. E-learning expert Kai Sostmann presents apps and online applications that can be useful in treatment and rehabilitation. "Moves" is a free fitness app that automatically records all movement, be it walking, cycling or running, without assessing it. The app operates permanently in the background and does not need to be started. "The app allows for the compilation of an individual activity profile", says Kai Sostmann. "This is interesting not only for people wanting to remain healthy, but also for people who need to observe sufficient exercise, for instance, cardiovascular patients." By way of Yes/No questions on symptoms and complaints, users of the "Your Rapid Diagnosis - Mental Health" app receive a prospective diagnosis regarding their mental health. The application lists descriptions including indication and symptoms for 71 diseases and references other potential disease patterns. Cost: 4.49 Euro. Kai Sostmann says: "The usefulness of this app is debatable. I think the approach is interesting. One receives a first short diagnosis and a lot of information about disease patterns. The application is validated, supported by medical guidelines and is suited also for general practitioners." Yet as with any form of self-analysis, there is the danger of incorrect diagnoses. The disclaimer that appears immediately after starting the app reminds the user about the application's limits and the fact that it is no substitute for a doctor or therapist. The app merely provides information about disease patterns and their treatment and encourages individual users to seek professional help in the event of a relevant diagnosis. The application was developed by microbiologist David Macfarlane. The tablet app "Rehabilitation for lower limbs" addresses rehabilitation professionals, for example, orthopaedists or physiotherapists. They can use the app to compile information and exercises for patients with injuries to the lower extremities. It provides 340 exercises for a total of 165 forms of injury. The therapist can compile personalised exercise sequences for patients, add comments and save it all as a PDF. "If nothing else, the exercise videos make this sophisticated app a useful means of support for both physician and patient", says Kai Sostmann. The app runs exclusively on the iPad and, with almost one gigabyte, it is quite large. Cost: one-off payment of about 36 Euro (49 US Dollar) or monthly 3.70 Euro (4.99 US Dollar). The website www.lookatyourdrinking.com offers plenty of information about alcohol as well as an online treatment programme for British patients. The treatment programme addresses adults, who want to know more about their drinking patterns or who have decided to do something about their excessive alcohol consumption. Although the programme is not available as an app, but uses a website, it demonstrates nicely what blended health means. Professional online and offline help combine and complement each other: clients receive a tailored treatment programme and are supported by a professional addiction therapist. "This is where we are headed in future", says Kai Sostmann. "Online applications provide psychological support and can be extended by personal support." Treatment is anonymous and confidential. Introduction into the treatment programme and the first contact with a therapist are free. After that, the entire treatment costs about 2,400 Euro (£2000). A good example for a German-language prevention app is the free Android smartphone app "HaLT Alkohol Notfall" (Stop Alcohol Emergency), which helps young people to assess their drinking patterns and to recognise the dangers of excessive alcohol intake. Websites such as www.patienten-information.de or www.appcheck.de, the technical control board for health apps, provide information whether or not an app is reliable. On medicalappjournal.com , physicians provide detailed assessments for health-related apps in a strict peer review procedure. In a press release from 23 September 2013, the US supervisory authority FDA (Food and Drug Administration) announced that in future it intends to increase its monitoring of medical apps.